The all-volunteer Monticello Railway Museum was founded in 1966 as “SPUR” (Society for the Preservation of Unretired Railfans). Its goal at that time was to maintain and operate steam powered passenger train excursions. In 1969 the name was changed to the Monticello & Sangamon Valley Railroad Historical Society, Inc., and then in 1982 the name was again changed to the present day Monticello Railway Museum. The museum offered the first train ride in 1972. Trains operate on both former Illinois Terminal and Illinois Central trackage. At the museum site, round trips depart from an Illinois Central depot, built in 1919 at Deland. In downtown Monticello, round trips depart from the 1899 Wabash depot. Volunteers have begun building the Lionel 40’s layout in the storage compartment of the Illinois Central R.P.O. 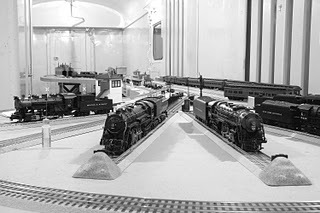 This photo (kindly supplied by Ron), shows the engine terminal without its future roundhouse on the 33-ft Lionel 40’s layout. The Monticello Railway Museum is located off Interstate 72 at Market St. Exit 166. USA.